Mask ventilation using the modified V-E technique is more effective than with the C-E technique in unconscious obese apnoeic adults. Subjects who fail ventilation with the C-E technique can be ventilated effectively with the V-E technique. Conclusion: In a simulated model, both 2-handed mask-face sealing techniques resulted in higher ventilatory tidal volumes than 1-handed technique. Tidal volumes from 2-handed and modified 2-handed techniques did not differ. Female subjects were able to generate expired tidal volume more similar to that of male subjects with the modified 2-handed technique. 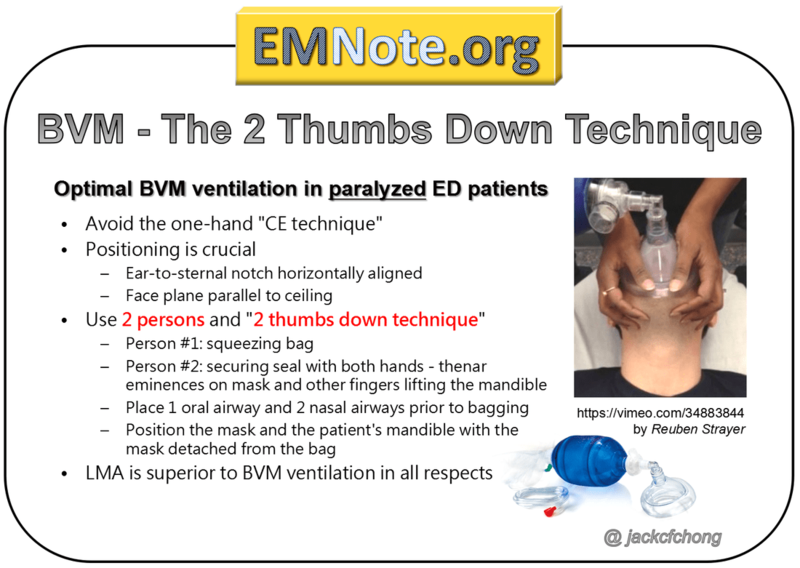 Rescuers should perform bag-valve-mask ventilation with 2-handed techniques. ​Image courtesy from "ABC of resuscitation".